There are certain films which are based on outer space and lot of robotic characters are displayed in such films. George Lucas, an American filmmaker and entrepreneur, created a series of films under the banner of 'Star Wars' which is an American epic franchise, based on films related to outer space. The first film in the series was produced in the year 1977. One of the films in this series was produced in the year 2015, and the name of the film is "The Force Awakens". This is the film where a robotic toy (or better known as droid) played the character known by the name BB-8. 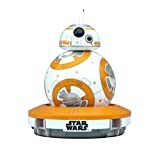 Now, this BB-8 droid has gone very popular over internet and it is also available for purchase on different online websites including Amazon. Here is a nice video clip of this droid from the film "The Force Awakens". But this BB-8 toy robot sold over internet, or anywhere else, is not that large as what you see in the movie. Its much smaller than that. This robot is made from two important parts. One is a bigger sphere, acting as its body, while there is a much smaller hemisphere (half of sphere) acting as its head, and both are attached to each other with magnetic forces. Another important part of this droid is the "charging base station", where the body of the droid is actually inserted to charge it. There is also a USB cable provided, to connect the charging station with your laptop, in order to charge the droid or so called space robot. It may take 3 hrs for first time charging through a USB cable. Some laptops, however, do not have enough power to charge the robot via USB cable. In that case use 110V to USB adapter (like what you charge your smartphone with) first. This robot is controlled by an app that can be downloaded on your android smartphone, or an iphone, or a tablet from the official website starwars.sphero.com . Before purchasing this item you need to make sure that your phone is compatible with the app used to run this robot. Once the app is downloaded on your phone, you can use your phone to control the robot through different features of the app. So, remember, this robot will be controlled by the app in your phone and not any remote control which require lot of batteries. Bluetooth on the phone must also be turned ON while operating the robot through the phone. Once the app is downloaded on your phone, you will find that there are 4 main options in the app, with different names like Drive, Message, Patrol and Settings. Through the first 3 options one can do different things with the robot. Settings option is only used to change settings of the various features involved. For example, if you want to turn on or off the sounds made by the robot, it can be done in the settings option. Also the speed of the movement of the robot can be controlled from settings option. By the way, the sound generated while the robot is speaking is something like that of an alien from outer space, often shown in different movies. Its such an unbelievable and cool product I ever show. Drive option is basically used to take control of the movement of the robot in different directions including spin. Message option is used to record messages and feed to the robot so that the robot can repeat those messages when asked. Patrol option is where the BB-8 find its way on his own when stuck somewhere. Lot of fun things can be done with these 3 options and you must watch this 30 min useful video demonstrating the functions of this awesome product.